I've referred to the Rambler's Magazine before (here and here), an early 19th century compendium of titillating tidbits. The following excerpts come from its July 1822 issue. DUNNING AND THE WITNESS.—A handsome young woman, who was a witness in a trial of crim. con. 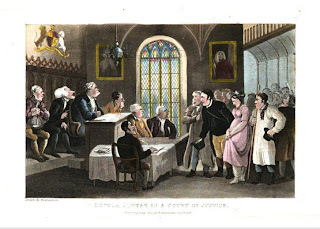 before Lord Mansfield, was interrogated by counsellor Dunning, who, thinking to confuse the woman, made her take off her bonnet, that he might have a view of her countenance, and see (for all counsellors are complete judges of physiognomy) whether the truth came from her lips. After he put many ridiculous questions to her, he asked her whether her mistress had ever communicated the important secret to her. "No, sir," said the woman, "she never did." "And how can you swear to her infidelity?" "Because I saw another gentleman, besides my master, in bed with her." "Indeed!" said the counsellor. "Yes, indeed, sir.'' "And pray, my good woman," said the modest counsellor, thinking to silence her at once; " did your master, (for I see you are very handsome.) in return for his wife's infidelity, go to bed to you?" "That trial." said the spirited young woman. "does not come on to-day, Mr. Slabberchops." Lord Mansfield was tickled to the soul; he thrust his hand into the waistband of his breeches, (his custom when highly delighted,) and asked Dunning if he had any more interrogatories to put. "No, my lord, I have done," said the chop-fallen orator, settling his wig, and sitting down. FORGETFULNESS.—The Right Honourable Henry D—, on the morning following his wedding-day, arose from bed much sooner than might have been expected; he dressed himself, went down into his library, and rung the bell for breakfast. The noble secretary's servant, on entering the room, wished his master much joy, and hoped he might have many years of happiness with his lady. "My lady! by G—d, I forgot her!" replied the gentleman, and immediately returned to his chamber, went to bed again, and endeavoured to atone to his wife for his apparent neglect. —The Rambler's Magazine: Or, Fashionable Emporium of Polite Literature etc., Volume 1, 1822. 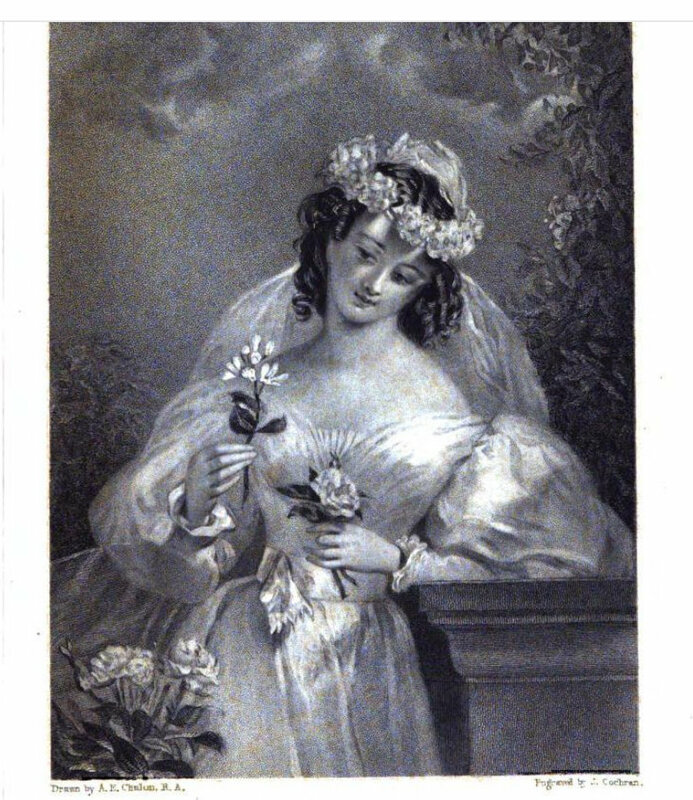 Black and white illustration from Heath's Book of Beauty, 1833. "I forgot her!" Absolutely priceless. LOL A gentlemen to forget his lady? It sure is hard to lose a routine after marriage. This will be great in a book!